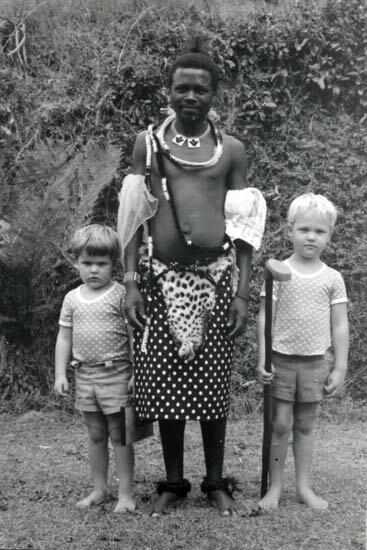 Photographed in the 1970s, two European boys born in Africa pose with a Swazi warrior in Bulembu, Swaziland. Their family migrated to New Zealand in 1983. Much of Africa was colonised by European powers, and as a result European settlers or sojourners arrived. Most countries were part of the British or French colonial empires, and generations of European people have been born and raised in Africa. The majority of New Zealand’s African-born people are white emigrants from former British colonies.